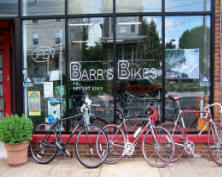 Barr’s Bikes and Boards opened in 2010 to service the cyclists and skateboarders of the Roxborough-Manayunk area. What the small Mom and Pop type shop lacks in size is compensated by their superb customer service, stock, and turnover time on services. Self-labeled as “the friendlier bike shop,” Barr’s truly services every person on wheels, whether it be a bicycle, skateboard, or e-bike, which can usually only be found at the sole e-bike shop in Philly, PHEW! (Philly Electric Wheels). Located at 5548 Ridge Avenue, Barr’s provides full repair services, as well as selling a range of new and used bikes including the standard bike styles, as well as folding bikes, flyers for kids, retro styles, and e-assist bikes. The shop’s extensive work bench uses Park Tools for a quick turnaround time on all repairs; they’ll also help you sell your old bike. The shop has an extensive stock for bicycle accessories, including bags and baskets, racks, safety equipment, and trailers and trailer cycles. Unlike most bike shops, Barr’s Bikes and Boards caters to skateboarders as well as cyclists. 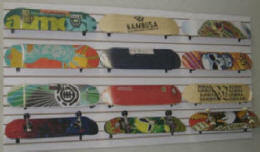 Barr’s stocks a variety of decks, trucks, wheels, bearings and grip tape, and offer to assemble your custom board; they also stock fully assembled boards. Dedicated to the customer, Barr’s Bikes and Boards provides equipment and wheels for anyone looking to get around quicker, whether hitting the trails, zipping through the streets on an e-assist bike, or landing kickflips.